Blessings counted: Fr Pat Doran, who counts his blessings as parish priest of Dorrington, takes in the view of Brisbane city out the back of St Michael’s Church. “ONE day we buried twelve children …” – victims of war and famine, and as Fr Pat Doran thinks of them almost 60 years later the memories come flooding back, and so do the tears. Those children and thousands like them are close to the heart of the Holy Spirit Father nearing retirement from his Brisbane parish. In the little Irish town of Rathnew, south of Dublin, he was once told he would never set foot beyond the altar rails to serve at God’s table and has gone on to do exactly that for almost 59 years. It seems Fr Pat’s used to doing what others tell him he can’t or shouldn’t do. Only last year, at the age of 86, he decided he wanted to go back to Papua New Guinea to lend a hand in missionary work there. Others, including some of his parishioners at Dorrington in inner north-west Brisbane, tried to convince him not to go and told him all the reasons why it wasn’t a good idea. He went anyway – for three months. It’s a bit like when the young Pat was told he couldn’t be an altar boy; he went one step further and became a priest. Pat was the fifth of seven boys born to Lill and John Doran – a good Catholic family in Rathnew, County Wicklow. “All my six brothers were altar boys and when I learned the Latin to go with them on the altar, the lady in charge said, ‘You can’t go on the altar – you’re the biggest brat in the village. Never, you’ll never go inside the altar rails …’,” Fr Pat said, laughing as cheekily as that little boy may have been, as he recalls that day. Young Pat “never considered doing anything else” other than becoming a priest. 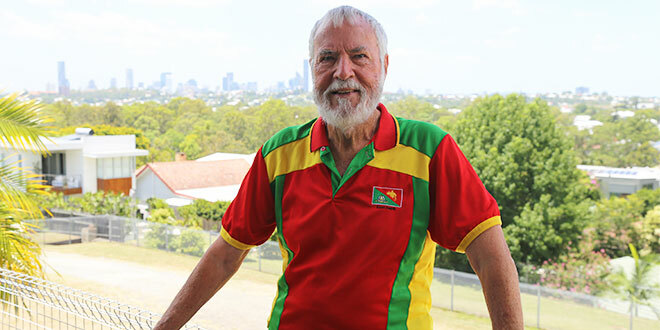 “When I finished primary school – I went to the De La Salle Brothers – and the Brother interviewing me said, ‘What languages are you going to have?’ and I said, ‘I will certainly have Latin’,” he said. Fr Pat was 14 then, and halfway through high school he was accepted into the minor seminary by the Spiritans, or the Holy Ghost Fathers, as they were known in Ireland then. His love of the Mass attracted him to the priesthood and a desire to help poor people drew him to the Spiritans. He had read their magazines and was inspired by the stories about the missionaries. Ordained in 1959, Fr Pat and about a dozen other newly ordained Spiritans were sent off a year later on mission to Nigeria. It was tough and, after about two years, Fr Pat copped a bout of tuberculosis. “I was sent back to Ireland and hospitalised for six months, and recovered and came back to Nigeria, and everything was good … until ’66 and the Biafra War,” he said. “Civil war started and the BBC broadcast an order that … the British Government said all foreigners must leave and they gave us time – about four weeks. “There were three-hundred of us missionaries there, and we refused to leave. “The government and military had sealed off the whole tribe of Ibo. All the roads were closed, all airports were closed, all seaports closed. “Nobody was allowed in or out. “The year went on, and the next year we had famine. Meanwhile, one of the Spiritans back in Ireland hatched a plan with a contact in Portugal to hire pilots to fly food in for the people who were “starving in great numbers”. The Catholic, Anglican and Lutheran churches joined forces to “fly in food at night, over the guns, onto a road in the jungle”. “And then the federal army discovered what we were doing, and they had an anti-aircraft gun … and we had what we called an intruder, when you hear a bomber coming over to drop bombs on us,” Fr Pat said. As the famine stretched into the third year, the Marist Brothers where Fr Pat was serving discovered 300 children in the forests, separated from their parents and barely surviving. “They brought them to their place and almost every day we had deaths,” Fr Pat said. “Children were dying. We couldn’t save them. Tears come with the memory. Then a Red Cross hospital was bombed, and soldiers killed four doctors. “And we were warned, so we decided to leave and try to get help, and halfway out we were stopped by two jeeps, and soldiers jumped out and took us and the soldier that had me put a gun in my belly,” Fr Pat said. “I looked down and he had his finger on the trigger. “‘Me shoot you. You’re not a missionary, you’re a mercenary’ (he said). The young missionary was safe for now, but he was still in danger being held prisoner for a further 10 days. The soldiers continued to accuse him of “feeding the enemy” and still threatened to kill him. This only changed after a public outcry over the shooting of the four doctors at the Red Cross hospital. The soldiers’ superior officers told them “you’ve made a big mistake, a big mistake, in killing those doctors. Release Fr Doran”. He heeded the warning and returned to Ireland but, after about four months, his superior, who was still in Biafra, asked him to go to Sao Tome, a Portuguese island off the coast of Nigeria, where the Spiritans stockpiled food and medical supplies for the starving people on the mainland. Fr Pat’s job was to fly in regularly at night to check on the food situation and what was needed. He left two days before the collapse of Biafra in January, 1970. “There were three-hundred of us deported then,” he said. After four years teaching in Ireland and youth and vocations work in Canada, Fr Pat served in Malawi, another poor nation in Africa. “When I came out of Malawi, I had a breakdown – post-traumatic stress,” he said. “We got no help after we came out of Biafra and all the horrors we saw there and when we got back to Ireland. “We covered up all the anger and grief, but it came back on us about ten years later. Fifteen years ministering in PNG, at Aitape and Wewak, was good for him. “Of all the places, I loved PNG – the people of PNG,” Fr Pat said. “The charism of our order is we live among the people so we get to know them very personally, and (the people of PNG) are very likeable. The past 17 years in Dorrington parish have also been good for him. The Spiritans had ministered in the parish since 1970, and Fr Pat said the people have become “very fond” of them. “As a human being, as a person, I have never been loved as much as I’ve been loved here – not because I’m great or anything like that but because the people are that way,” he said. And Fr Pat knows God has been good to him. “When that soldier wanted to shoot me … I was inwardly saying ‘Lord, I don’t want to be a martyr’ but I was able to say to that soldier, ‘You may shoot me now but one day, maybe soon, you will stand before the face of God’,” he said.